Anyone who has made a habit of reading this blog (and, frankly, anyone who ever met me) is aware that crafts are not generally my jam. DIY has always been a foreign concept to me: like, Whyyyyyy would I spend hours making a wreath when I can buy them at Trader Joe’s for $9.99? Let the record show that my own mother is a brilliant aesthetic mind. A trained landscape architect who owned a flower shop in San Francisco in the ’70s, taught the art of flower-arranging to practically every single little girl in the Bay Area (including her own – ha!) during the ’80s, ran a small business selling topiaries and her famed Tooth Fairy Pillow during the ’90s, she now works full-time AND manages to beautify everything she touches with a kind of enchantingly cluttered whimsy. And yet, despite the fact that I was raised with the scent of the glue-gun in the air and weekend after weekend of flower-fairy party in the basement workroom, I inherited very little of my mother’s actual talent. Her eye, perhaps. But not her talent. Which is why I am intimidated when along comes Babygirl, all eyelashes and Buddha-belly and good old-fashioned insistence that her mommy pull herself together and get crafting like all the other good mommies of the world. Babygirl began to drift in this direction back around Halloween, which is how I found myself in a Financial District Walgreens at 3pm on an October Saturday sourcing tube socks, Elmer’s glitter glue, and Sharpie pens of assorted colors. 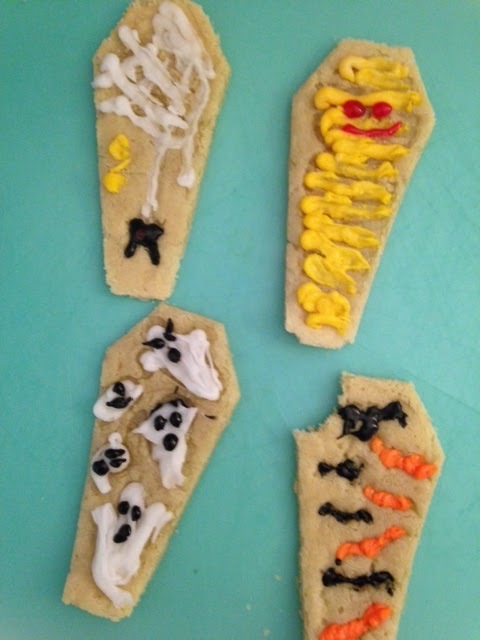 The Tube Sock Ghost Initiative was quickly followed by spooky coffin-and-skeleton cookies, and then several weeks in a row of pumpkin corn muffins, which Babygirl proudly delivered to her preschool classmates in Ziploc bags. With all this lead-up, by Christmas morning I was prepared. Santa himself delivered Babygirl a giant box full of cupcake mix, various frostings and sprinkles, and of course colorful toppers. The cupcakes were baked by noon. But the piece de resistance, the proof that even the most avowed non-crafter can be converted, was my tablescape. As an aside, when did “tablescape” become a thing? As with the entire DIY movement, I blame Martha Stewart, Sandra Lee, and Pinterest with equal measure. Time was, you could break out the wedding china and the big wine glasses and iron a tablecloth and be done with it. But now: Oh, the pressure! What is the THEME of your Christmas? Like most people, the theme of my Christmas is Christmas, and the general survival and enjoyment thereof. But now we have options like “rustic Christmas” or “gilded Christmas” or “city Christmas.” And DON’T EVEN THINK about doing your DIY alone, because this is Christmas and Christmas is for families, and most of all for children, and you should involve them in your tablescape because that’s how you HAVE FUN and MAKE MEMORIES. Can you believe I drank this Kool-Aid? I did. I totally did. In late December, postmodyrn ran a clever feature on holiday tablescapes by my friend Jess — who is a professional designer — over at Nest Studio, the publishing of which involved some time exploring tablescapes on Pinterest. The same day I posted the article, I made a last-minute run to Cost Plus World Market to pick up some stocking stuffers, as well as linens for our Christmas table. Suddenly, standing in the linen aisle of Cost Plus, damask napkins in hand, oscillating between white and forest green and red for the tablecloth, a light suddenly flashed in my brain. I am a changed woman. I am a woman who crafts. 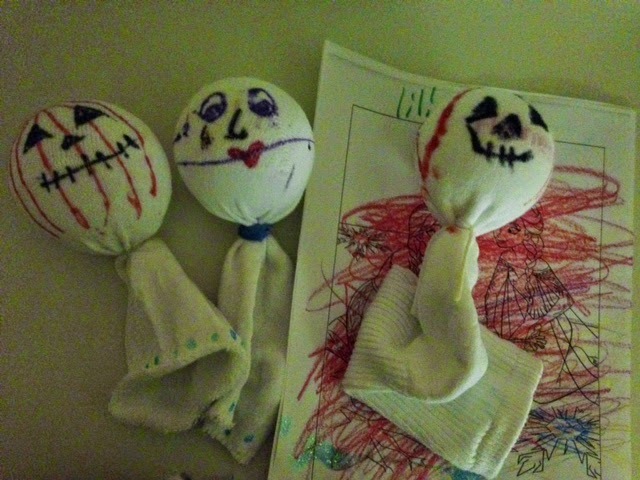 I made Tube Sock Ghosts at Halloween, dammit. I threw the linens back into the shelf and bolted for Blick Art Supply. “Did you wind up getting a new tablecloth?” my husband asked innocently that evening. There was a pause. “Ooookaaaay,” my husband replied. On Christmas morning as planned, as my husband marinated a leg of lamb and set up the outdoor bar, and Babygirl began following me around sniffing for crafts, I went to the kids’ room and unrolled my butcher paper, a veritable pristine carpet of white like the new-fallen snow. Paint was poured into plastic Lightning McQueen plates, sponges cleaned and sorted in star and ornament shapes. Babygirl assumed her position, barefoot at the edge of the paper. 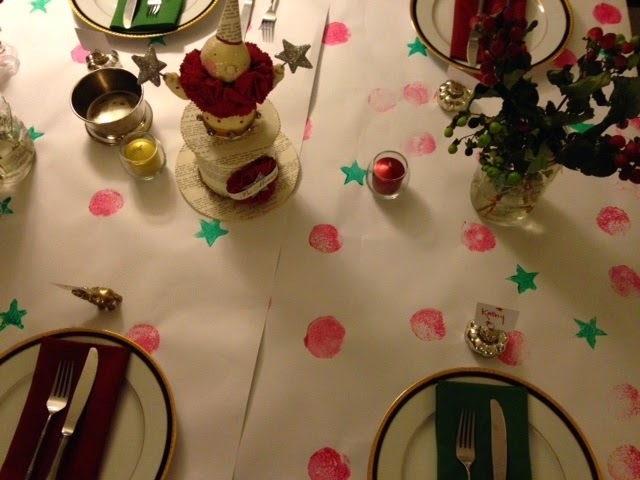 With a sigh of satisfaction, I tuned the radio to the campy 24-hour Christmas station, sat on my knees next to her and we commenced our tablescape-memory-making. What followed went something like this. “Okay! I am so glad to have you as my helper! So here’s what we’ll do. Just dip your sponge flat in just a little bit of paint…okay, maybe a little less paint than that to start…you’re dripping, Love, let me…okay, well, we can get that out…And now, just dab the sponge on the paper, Lovey, just dab it so lightly…No…Don’t smear it…Please stop smashing it like that…It’s better if you dab it, like dab-dab-dab, like this…Let’s try and mix up the colors, like red and green and red and green…Okay, I totally get that you like red the best, why don’t you put some red over there and Mommy will fill in this part with some green…” And so on. Roughly 15 minutes later I stood and surveyed our masterpiece, with its little clusters of red stars around the edges and a giant smeared paint blob on one end. I realized in that moment that, much as the final product on a cooking show isn’t actually cooked during the 26-minute program, the “do this with your kids!” projects photographed on Pinterest aren’t actually done with kids. They are done by adult bloggers, and photographed by professionals…and disseminated to mothers everywhere. Which doesn’t really matter, in the end. Early that evening after the paint had dried, I sat crouched under the dining room table in my workout clothes with a roll of masking tape around my arm, attempting neat hospital corners with minimal success. The kids roamed aimlessly, distracted at the prospect of grandparents arriving with more presents, the apartment smelled like cumin and cinnamon, and I knew I had bitten off far more than I should have. My husband clinked away in the kitchen. A glass of champagne was in my near future, but for now, I was too far into this tablescape business to cry uncle. Finally, we scattered our various snowmen, a few votive candles, and the aforementioned mason jars with holly and twine. It was festive and unusual and decidedly child-like. Not much like the vision on Pinterest, but still, unlike any table I’d set before. Special. A table where sons and daughters and nieces would spill pasta and parents and grandparents and neighbors would drip red wine and crumble bread well into the starry night. A table wrapped up in a craft wrapped up in a memory, inspired by my three-year-old and the creativity that brims inside her. Until she is old enough for a glue-gun, all we can do is try.